NJM’s Trotter Model 127 Pressure Sensitive Labeler is designed for applying metallic and paper labels with web height up to 178 mm and labels bottles from 25 to 356 mm high and 16 to 178 mm wide. The machine is suitable for use in cosmetics, personal care products, household chemicals and pharmaceuticals and come with stainless steel construction, raised bed-conveyor and is servo driven. The labeler is offered with an adjustable chain aligner, servo-driven overhead belt and a 10 in. color touchscreen. MONTREAL, AUGUST 8, 2018 – NJM, a ProMach product brand, introduces the Trotter Model 127 pressure sensitive labeler at Healthcare Packaging Expo Booth #W-703. Featuring controls from B&R Industrial Automation, the new Trotter 127 operates using an operator terminal with integrated controller to maximize production versatility, ease use and offer an affordable price point. NJM can configure the Trotter 127 to apply wraparound, front-and-back and 3-, 4- and 5-panel labels to round, square, rectangular and oval bottles, including spray cans and containers with handles. Applying clear and opaque plastic, metallic and paper labels with a web height of up to 7 inches (178 mm), it labels bottles from 1 to 14 inches (25 to 356 mm) high and 5/8 to 7 inches (16 to 178 mm) wide at speeds of up to 120 bottles per minute. Featuring stainless steel construction, a raised-bed conveyor and servo-driven precision, it is ideal for cosmetics, personal care products, household chemicals, pharmaceuticals, nutraceuticals, food products and more. With fewer controls and drive components, the Trotter 127 eases maintenance and speeds troubleshooting. All menus and functions are accessible through no more than two taps/inputs on the touchscreen. User access is password protected with multiple levels. The remote support capability enables remote troubleshooting, program updates and retrofits while the integrated firewall protects network security. The B&R Power Panel C-Series terminal with integrated controller offers advanced networking, reporting and communication software. Standard OEE (overall equipment effectiveness) auditing, which can be displayed on the labeler’s HMI and/or shared with line monitoring systems, automatically calculates OEE data to help increase productivity. An optional reporting capability enables the labeler to generate customized reports containing user-selected data in a user-defined format. The labeler can interface with line monitoring systems using OPC United Architecture (OPC UA) protocols and OMAC PackML standards. To facilitate changeovers, the standard Trotter 127 features reference counters and scales. An optional dual-label spool-unwind with a manual splice table speeds changeovers. Options for various labeling application devices are conveyor-mounted on a slide mechanism for quick changes. Recipes can be saved in memory and on a USB drive in editable Excel files. Ideal for product manufacturers and contract packers, the Trotter 127 can be changed over to handle a new container size, shape and label configuration in less than 15 minutes, with no tools required. The Trotter 127 features high quality components, heavy-duty construction, an open frame, raised-bed conveyor and servo-driven label dispenser for repeatable performance, low maintenance and long equipment life. This multi-functional labeler offers a footprint that is only 126 inches (320 cm) long and either 65 or 86 inches wide (165 or 219 cm), depending on if it has one or two label dispensers. Options include an adjustable chain aligner to orient containers or single or dual feedscrew drives if changeparts are preferred. 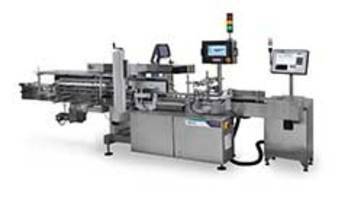 An optional servo-driven overhead belt stabilizes containers for multi-panel or front-and-back labeling. Label coding can be added with a hot stamp, thermal transfer or laser printer. Vision inspection stations can verify date/lot codes, bar codes and/or missing or skewed labels while an optional reject device removes containers with out-of-tolerance labels. For pharmaceutical packagers, NJM can equip the Trotter 127 to achieve serialization and facilitate downstream aggregation. The standard B&R controls can produce audit trails for 21 CFR Part 11 compliance.